DoubleOpen end Jaw Spanner sets. -7 to 30*32 sizes have available. 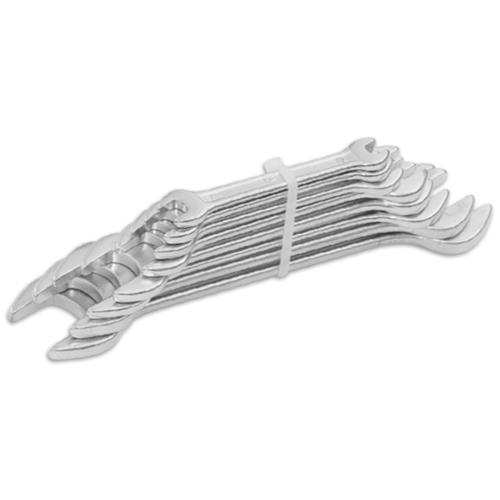 Available sets of spanner - set of 6, set of 8, set of 10, set of 12.6*7 to 30*32 sizes have available. Annual Turnover2013-14 Rs. 1-2 Crore Approx. Incorporated in the year 1986, we “Sagar Heavy Engineering Pvt. Ltd” are well-known Manufacturer, exporter and supplier of high performance range of Lathe Machines, Drilling Machines, Milling Machine, VTL Machines, Shaping Machines, CNC VTL Machine, CNC Lathe Machine, Hacksaw Machine, Slotting Machine, etc. Located Ludhiana (Punjab, India), we are supported by robust infrastructural base. Our infrastructural base encompasses various departments like procurement, manufacturing, quality testing, research & development, sales & marketing and warehousing & packaging. All departments are equipped with requisite amenities in order meet bulk orders of clients. Under the headship of our Managing Director “Mr. S. Kirpal Sagar”, we have gained huge success across the globe. Our team of dexterous professionals handles all departments. Furthermore, we also organize essential training sessions and seminars for our team of professionals in order to keep them abreast with latest technological advancement. Some of our reputed clients are BHEL, SAIL, NTPC, SIEMEN, L&T, etc.